The 21st century decline in recorded music revenues continues to send shockwaves throughout the music industry and although there are encouraging signs of digital-driven growth, the impact on artists is less straightforward. Total global artist income from recorded music in 2013 was $2.8 billion, down from $3.8 billion in 2000 but up slightly on 2012. Meanwhile artists’ share of total income grew from 14% in 2000 to 17% in 2013. But the story is far from uniform across the artist community. The music industry is a Superstar economy, that is to say a very small share of the total artists and works account for a disproportionately large share of all revenues. This is not a Pareto’s Law type 80/20 distribution but something much more dramatic: the top 1% account for 77% of all artist recorded music income (see figure). The concept of the long tail seemed like a useful way of understanding how consumers interact with content in digital contexts, and for a while looked like the roadmap for an exciting era of digital content. Intuitively the democratization of access to music – both on the supply and demand sides – coupled with vastness of digital music catalogues should have translated into a dilution of the Superstar economy effect. Instead the marketplace has shown us that humans are just as much wandering sheep in need of herding online as they are offline. 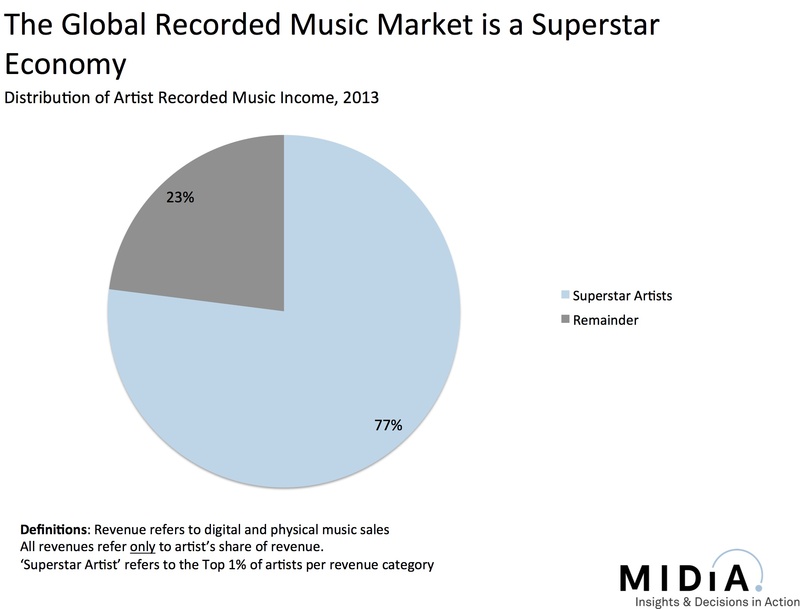 In fact digital music services have actually intensified the Superstar concentration, not lessened it (see figure). 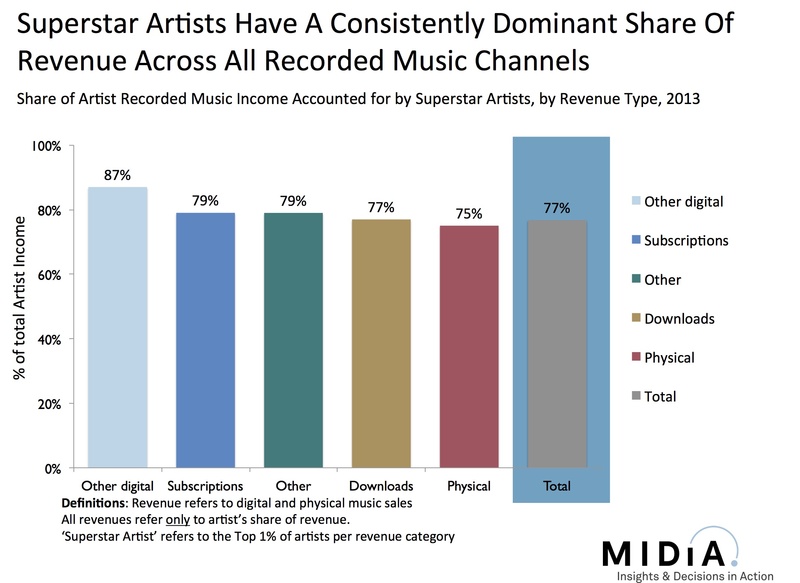 The top 1% account for 75% of CD revenues but 79% of subscription revenue. This counter intuitive trend is driven by two key factors: a) smaller amount of ‘front end’ display for digital services – especially on mobile devices – and b) by consumers being overwhelmed by a Tyranny of Choice in which excessive choice actual hinders discovery. Ultimately it is the relatively niche group of engaged music aficionados that have most interest in discovering as diverse a range of music as possible. Most mainstream consumers want leading by the hand to the very top slither of music catalogue. This is why radio has held its own for so long and why curated and programmed music services are so important for engaging the masses with digital. Music has always been a Superstar economy and there will always be winners and losers in music sales, with the big winners winning really big. Over time the improved discovery and programming in digital music services should push the needle for the remainder artist tier but a) it will not happen over night and b) it will still have a finite amount of impact. Matters are worsened by the music services’ catalogue arms race which has become entirely detrimental to consumers’ digital music experiences. Action needs taking urgently to make sense of 25 million songs, not just through discovery and editorial, but also by taking the brave decision to keep certain types of content, such as sound-alikes, outside of music services’ main functionality. Until labels, distributors and artists come to together to fix the issue of digital catalogue pollution – sound alikes and karaoke especially – the Tyranny of Choice will reign supreme, hiding 99% of artists under a pervasive shroud of obscurity and giving the Superstars another free lap of the track. This entry was posted in Artists, Major Labels, Music, Music Discovery, Music Strategy, Streaming, Subscriptions and tagged Artist Income, Artists, Catalogue Arms Race, CD, Downloads, Long Tail, music sales, Physical, Subscriptions, Superstar artists, Superstar economics, Top 1%, Tyranny of Choice by Mark Mulligan. Bookmark the permalink. This explains a lot to me about the last decade of music. I was actually thinking today about how the death of record stores would obviously compound this issue, as local curators disappear day by day. No suprise. Shift to 50 tune play list on all radio stations is forced by labels desperate for “live” income from super stars. Subscription streaming and advertising around FREE will give us at the best 35 billion industry in 2025. If we switch to discovery moment monetization we will surpass 100B mark before 2020. We need to wake up labels! Any word on how to download the actual report? I just subscribed to the email newsletter. Interesting thoughts about the ‘The Superstar Artist Economy’, what if this was your industry? What could you learn for your industry from these findings? George could you pls email me at mark AT midiaconsulting DOT COM. Because you have followed me as wordpress follower rather than an email follower I can’t see your email address. I also couldn’t find it on your blog. Do you have data that goes down below the share of the top 1%? I’d be curious to know what percentage of the total recorded music income pie that the top 10% controls. Is it more than 95% of the total pie? What is the historic evolution of the revenue share the top 1%. How much was it before the digitalization? While not specific to Colorado music, there’s some good info to be gleaned from this and other similar reports. Hi, This sounds interesting. Once I’ve suscribed, how do I get the full report ? As with the others, I’m very interested in getting the full report! Looks like you’ve done some good work. I signed up for the e-mail updates, but I’m not getting a confirming e-mail. Mark, just joined your malling list. How do I get to download the report? If anyone has signed up to the blog but has not yet received the report please email me at mark AT midiaconsulting DOT COM and I will send the report directly to you. Reblogged this on Can I May I. Without an explanation of who the full 100% of artists are, this article of 1% earning 77% has no real basis to compare to the past. My guess is that there are far more people converting recorded music into dollars nowadays, superstars notwithstanding, than at any time in the past. If the 100% of artists includes anyone who has a CD on CDBaby.com/iTunes, then the artist ‘count’ has skyrocketed compared to the artist count in the past. There is no death of the long tail, merely a continual extension of the long tail and a thickening of the long tail. Watch the BBC’s “Produced by George Martin” and specifically the comments George made about just a handful of hits by the Beatles earning the lions share of revenue for EMI, not just the Parlophone label. The EMI execs questioned him on why that was – why couldn’t he get every single Beatles tune to be a hit, or any of the other artists he produced. That one comment showed an even larger ‘tyranny of the superstar’ than what is now present. Scott – this data refers to all global artist income, so it is every single artist that is making their music available for purchase. The phrase ‘death of the long tail’ refers to the theory that the long tail will prosper, rather than to the actual presence of it. Mark, what Scott says (I think) is that many more people offer their music for money nowadays (because releasing music on the web just doesn’t bring any financial risks). Since there are many more participators, this 1% also becomes a larger group. This would just mean that there are many more ‘superstars’ then there were before. It makes sense that music that didn’t use to be ‘release worthy’ doesn’t sell much, but this music does contribute to shifting more artist into the top 1% in this model. So the shape of the long tail might have changed, but to draw the conclusion that people tend to listen to mainstream music now more then before would be a bit hasty I would say. The denominator of the fraction (total artists with releases) keeps getting bigger, but the numerator stays more or less the same (total number of artists making good coin from their recordings). That’s kind of how I see it. The number of successful people was small back in the day and it’s still small now. But back in the day, only the top 10% of artists were given an opportunity to release a record and there were few releases. Today, anyone can do it. So if we adjust for the inflation in the number of releases, the top 1% of today may not be that different in absolute size than the top 10% was back in the day. That being said, I do think that there have been some negative shifts at the bottom of today’s top 10%. Maybe that’s purely a function of there being more releases, making it into the top 10% doesn’t mean as much anymore (i.e., it’s akin to being at the bottom of the top 25% percent back in the day. Hard to say. But by the late 1990s, the cost of CD replication had gotten to the point where just about anyone could release one. Nevertheless, in that period it was still easier for people at the bottom of the top 10% to make some money from their records, put that together with touring and merch sales, and maybe manage a subsistence level full-time living as a musician. That possibility seems much harder to come by now. So while maybe 91st percentile was good enough to put you in that position at the beginning of the 21st century. Now, perhaps you need to be over the 94th or 95th percentile to get to that same place. Oops one mistake above. I should have said the following: “but the numerator stays more or less the same or has at least grown more slowing than the denominator has (i.e., total number of artists making good coin from their recordings). Yes, that is what I meant. I think comparing the top 10% from earlier days with today’s top 1% is a good illustration. Musical taste is now dictated by television, including festivals of mediocrity like American Idol. But has this figure (23%) improved over the years considering the pie / total revenues to the ‘remainder’ rising, while the absolute numbers of such indie artists also exploding simultaneously? 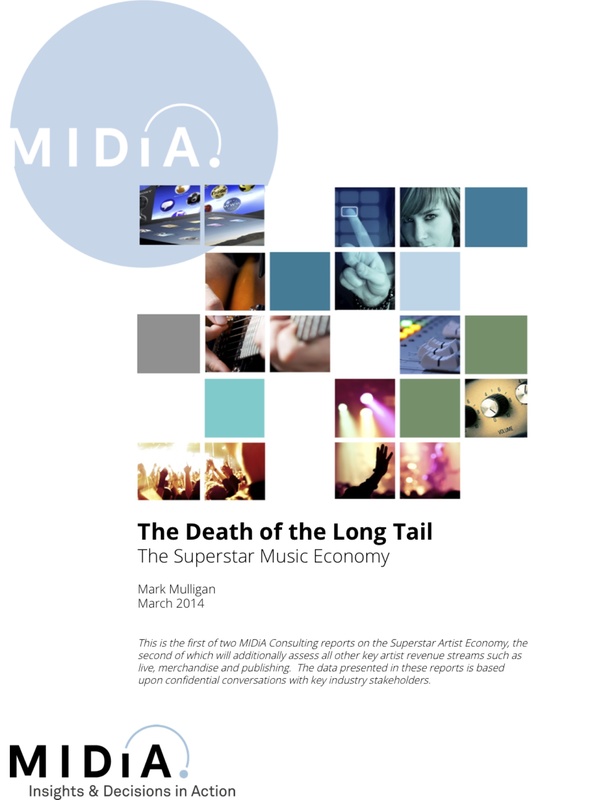 These stats on the long tail in the music industry are especially interesting and informative. How do you feel about the recent ‘free-to-stream’ kind of setups like Spotify and Pandora? Do they have different impacts on the long tail in digital distribution of music? Algunas ρublicaciones me gustaron bastante mas ρero no esta mal Animo! Hi Mark, I’m very interested on the full report. How can I have it? I already joined the mail list but i haven’t received the report yet. Awesome post! I actually linked your article onto mine that talks about the same concept of long tail but in terms of streaming! And it is so aggravating how the music industry still has a hierarchal structure, you think that because music is so free for expression and creativity that it would be a medium that allowed everyone to cash in but unfortunately, unless you are a Beyoncé or Ed Sheeran of the world there is very small hope for niche musicians to become have a piece of the 1% pie. Can’t believe I just found you now! Looking forward to reading more of your posts about the music industry. The long tail theory has a problem or flaw or something missing. The problem of this is that doenst take into account who is buying what, how are people bying. If ALL the buys from the 80% came from a single specific ULTRA rich person and everyone else just buy something from the top 20% not presenting this info is misleading since it shows important information.